The UO's Raghu Parthasarathy is embarking on a potentially high-reward project with researchers from two other universities. The team will begin by using zebrafish larvae to study how a cholera-causing bacterium, Vibrio cholera, colonizes the gut. The ultimate goal is to find ways to manipulate microbial communities in people's stomachs and intestines to treat specific health and medical needs. The project is among those funded by the Gordon and Betty Moore Foundation and Research Corporation for Science Advancement. In all, 13 grants were awarded to five teams of investigators as part of 2015 Scialog (Science + Dialog): Molecules Come to Life. The grants, totaling $731,000, enable the awardees to pursue high-risk, highly impactful discovery research on untested ideas in physical cell biology. Each investigator receives $56,250. 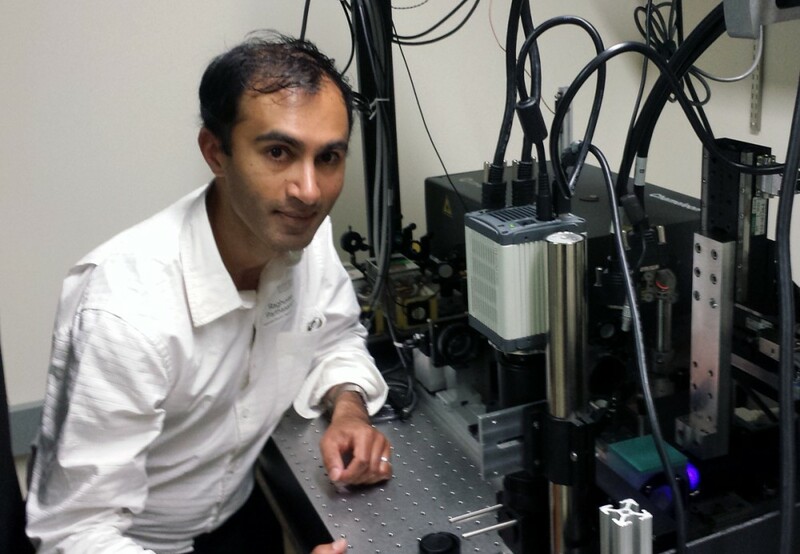 "I'm excited about the project," said Parthasarathy, an associate professor of physics who also is affiliated with the UO's Institute of Molecular Biology and Materials Science Institute. "We've been working for years on three-dimensional imaging techniques that allow us to visualize the gut microbiota, and this award helps us build on this to develop ways of manipulating bacterial ecosystems." He will work closely with Brian Hammer, a biologist at the Georgia Institute of Technology, and Joao Xavier, a computational biologist at the Memorial Sloan-Kettering Cancer Center. About a third of the project will be done at the UO and build upon the UO's pioneering research program using zebrafish, Parthasarathy said. The project is likely to involve both graduate and undergraduate students. The three scientists began their collaboration at the Scialog conference held earlier this year at Biosphere2 in Arizona, where some 50 leading young scientists from biology, physics and chemistry engaged in intensive discussions designed to produce creative ideas for innovative research. The team's project is detailed at ‘Personalizing’ Gut Microbial Communities to Achieve Innovative Medical Treatments.